Sherry cuts batting for a Rail Fence top. There is a sense of serene joy about sewing a few fabric strips together to make traditional patchwork blocks. 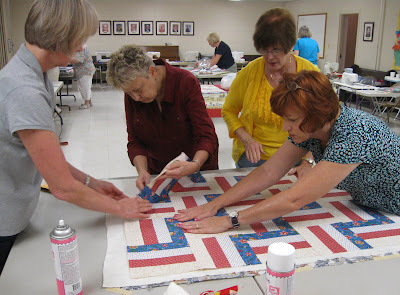 This past Saturday, my quilt guild, the Choo Choo Quilters, held its annual Cuddle Quilt workshop at which we get together and make lap and baby quilts to support the Children's Home Chambliss Center. 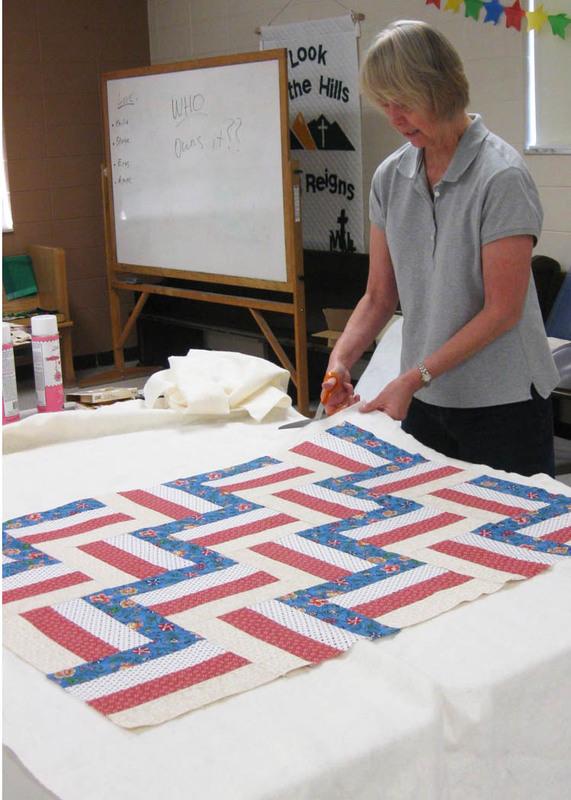 This year's easy-sew block pattern for the guild's community service sew-in was the rail fence quilt block. The simple graphic nature of this time-honored quilt block yields endless layout possibilities as well as visual surprises with a mere change of fabric value, color or print. I don't remember ever making a quilt using this pattern, but found myself really enjoying the process with its single focus on just sewing an accurate quarter inch seam. What could be easier and more relaxing? 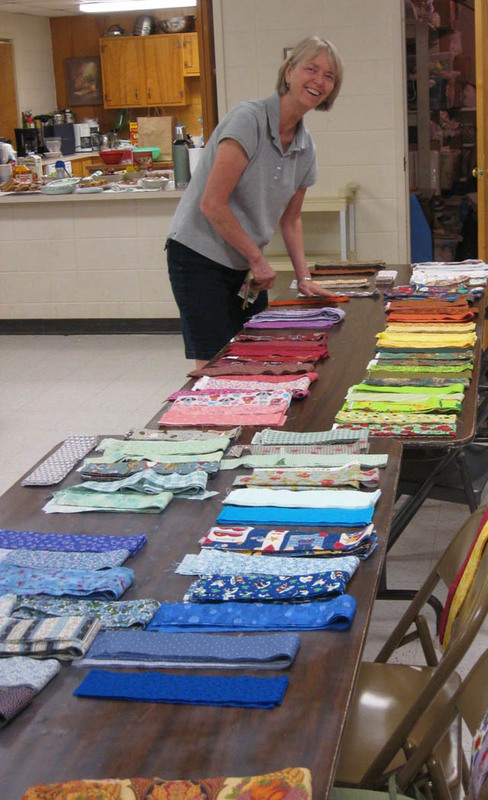 We started with 2.5" strip contributions from everyone's stash. 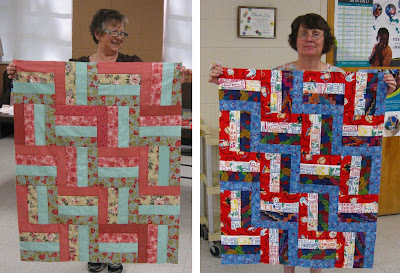 This is also a great application for Blank Quilting's Fabrications strips which are already cut and ready for sewing. 2-1/2" strips cut from our fabric stashes. 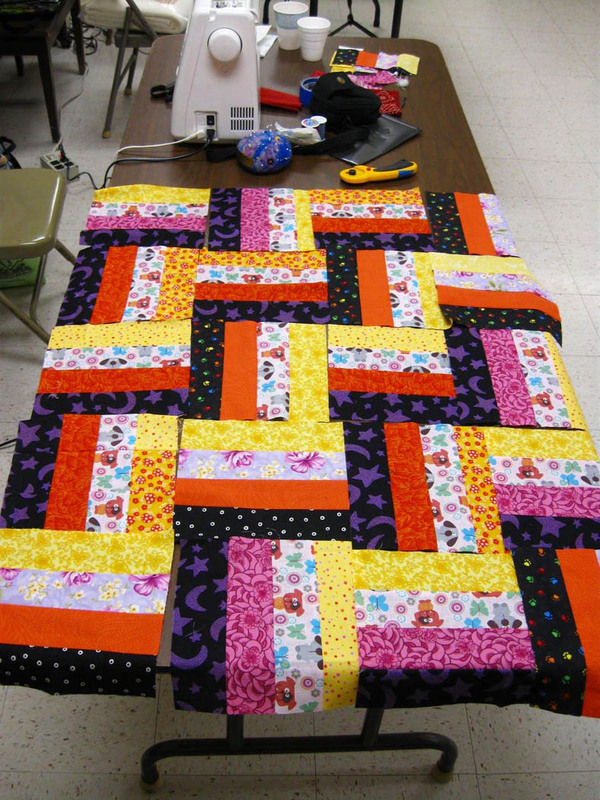 Yes, the piecing is simple, but by no means is this quilt block boring—in the assembly nor its visual appearance! Linda is chain piecing the strips. Ginny presses the strips before sub-cutting into the blocks. A rail fence block layout. We again employed the spray basting option this year after perfecting the team-baste concept at last year's workshop. By about 3pm, we had 23 quilt tops basted and on their way home with guild members for quilting. 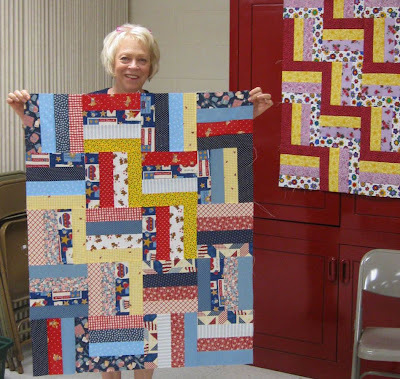 We also added 5 completed quilts to our donation. Spray basting speeds up the process. Below are some of the examples of the rail fence layouts. The placement of lights, mediums and darks in the strip sets offer variations in the pattern's appearance. 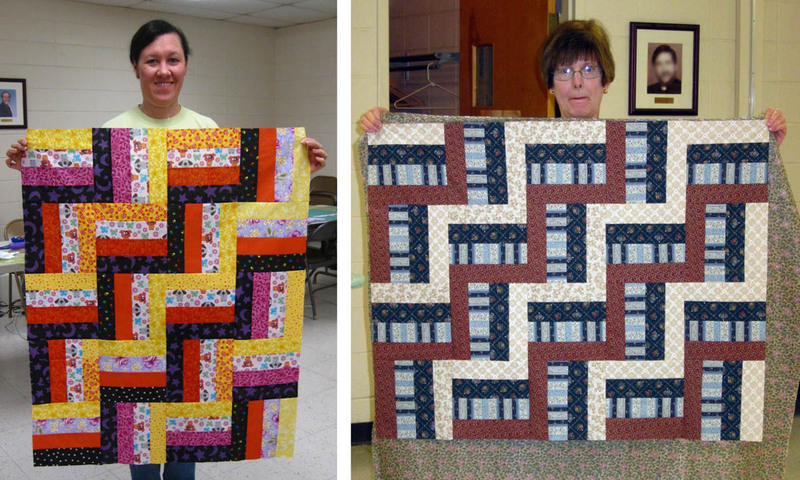 Rhonda (left) and Linda (right) with two quilt tops. 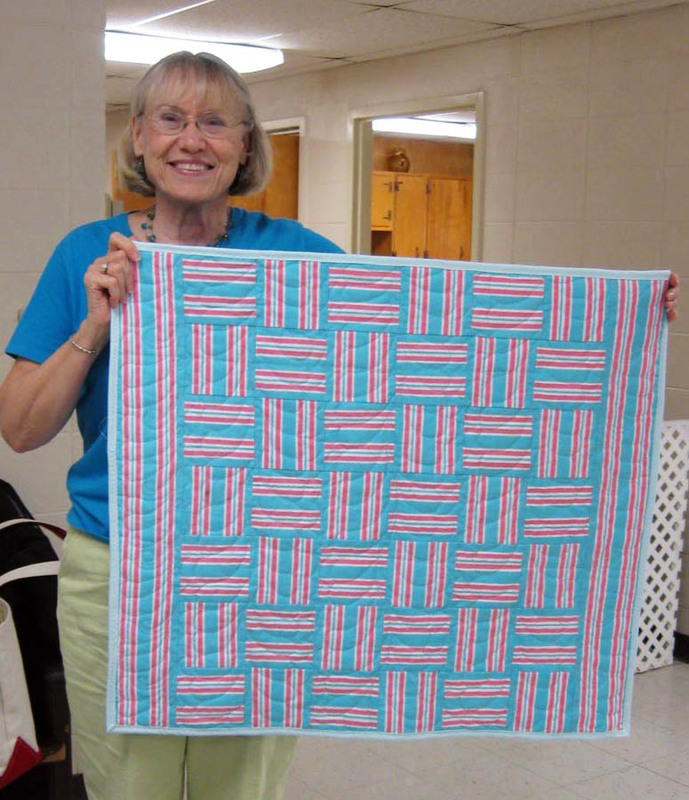 Try a striped fabric for one of the strips. My rail fence version (left) had a doggie print and bright colors. Becky (right) used a striped fabric. This really jazzes it up! This one is a scrappy version. Ginny shows her scrappy version. The workshop prototype hangs to the right. A striped fabric makes a fast alternative and offers a woven look. Vista used a single striped fabric throughout to achieve a woven look. This classic quilt block has vast potential... try changing the placement of values, the number or size of the strips, the size of the blocks, layout options, or how about solids? After being on the road for my Blank Quilting Fabric Rep Trek (see my blog Archives for posts), it was a welcomed change to sit at the sewing machine, chat and catch up with my wonderful guild friends, and make quilts for someone else—and for the pure joy of the sewing process. 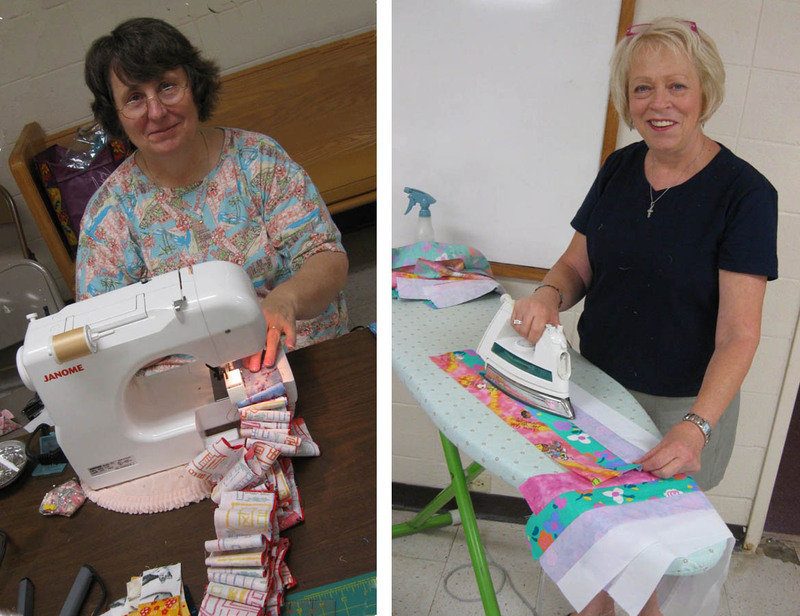 We sewed all morning and into the afternoon, not breaking for lunch. 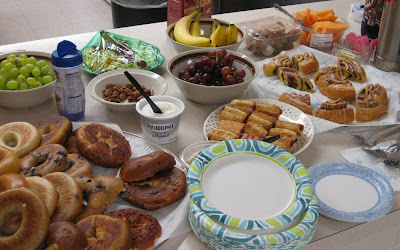 Of course, we had plenty of grazing fodder to keep up an appropriate energy level. And, the eclectic music mix kept heads bobbing and toes tapping through the day. A workshop feast for the tummy. Thanks, Sherry, for another fantastic job coordinating this event for the Choo Choo Quilters! I recognize those dogs and pawprints - glad my stash could help and wish I could have been there with yall longer. I know you had a good time together. Loved the doggies, Janet. Thanks for cutting strips. Every bit helps. Once again, you have done an excellent job of expressing both the process and pleasure of our day together. Thank you! Our Choo Choo friends are such good company. It made our work seem effortless, passing the day in a relaxed, encouraging atmosphere. I've quilted the two I took home. Anyone up for attaching the binding?? ?